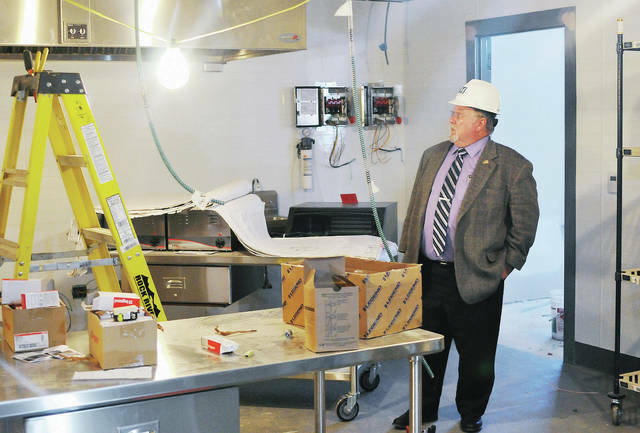 Shelby County Commissioner Bob Guillozet looks over what will be a new kitchen at Fair Haven Shelby County Home Thursday, Jan. 31. 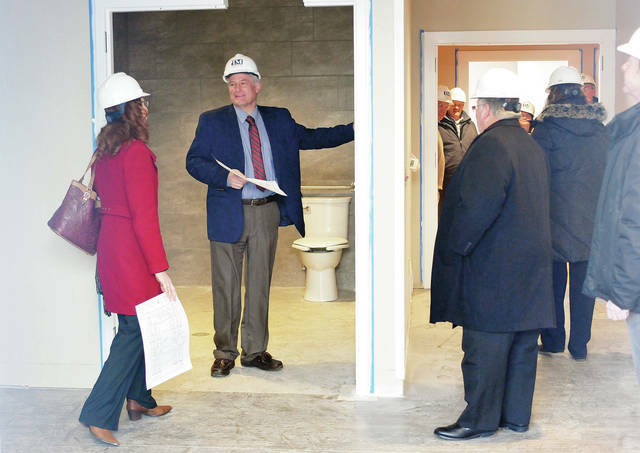 Shelby County Commissioners, left to right, Julie Ehemann, Tony Bornhorst and Bob Guillozet look at one of the private suites being built at Fair Haven Shelby County Home. The commissioners took a tour of the new addition, Thursday, Jan. 31. 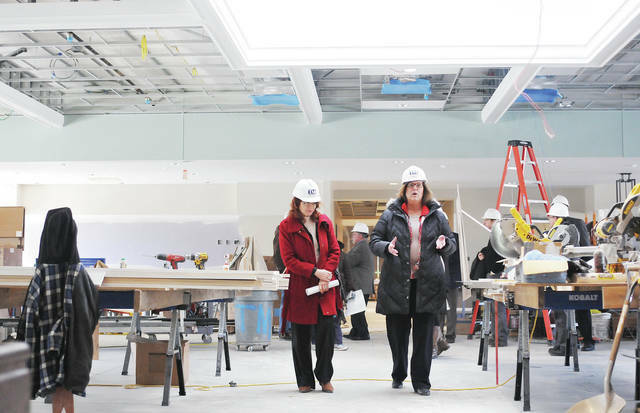 Fair Haven Shelby County Home Executive Director Anita Miller, right, gives a tour through what will be a new cafeteria at the home, Thursday, Jan. 31. At left is Shelby County Commissioner Julie Ehemann. SIDNEY — Workers were busy painting door jambs, installing pipes, drilling to put in ceiling panels, fitting together bathroom cabinets and more as Shelby County commissioners Julie Ehemann, Bob Guillozet and Tony Bornhorst toured the construction site of the addition to Fair Haven, the Shelby County home, Thursday, Jan. 31. The 30,000-square-foot, $13 million addition is “exactly where they need to be to be right on schedule,” said Dan Freytag, of Freytag and Associates, the project’s architects. Fair Haven residents are slated to take occupancy in mid-April. What the commissioners saw, Thursday, were single- and double-residency suites that have been painted and have bathroom fixtures, floors, windows and ceilings installed; patio rooms with access to an outside courtyard; activity areas; a serving kitchen; a spa room that will have a whirlpool tub; a private laundry room, a mobility suite equipped with isolaltion vestibule and a dining room named the Meadows. The Meadows, comprising about 3,000 square feet, will serve as a multi-purpose room and theater, as well as a dining room. “To have a space like this is very, very helpful,” said Fair Haven Administrator Anita Miller, who led the tour. She remarked along the way about features of the building that will be particularly useful to staff and residents. “Each room has its own thermostat,” she noted. Niches at various places along the hallways will allow for storage of equipment and keep the hallways clear. The hallways — named Walnut Lane, Elm Crossing and Sycamore Grove — have rails at hand level, but also near the floor, to prevent wheelchairs from bumping into the walls. She pointed out a space off the serving kitchen in the Meadows that will eventually hold a dessert counter and indicated a movie screen that retracts to the ceiling when not in use. Contractor of the project is Thomas and Marker, of Columbus, who was also responsible for a Fair Haven addition in 1975. “They have had 80,000 hours of work on this project so far without an accident,” Miller said.